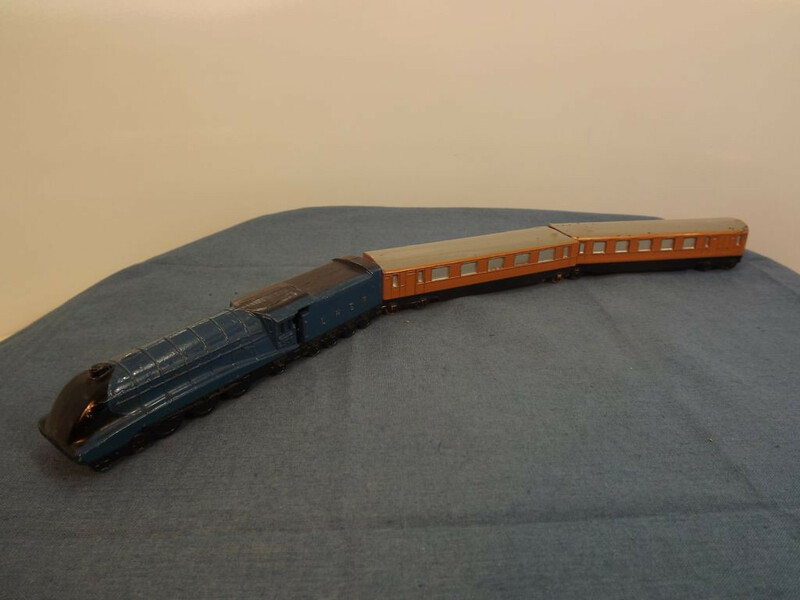 This model is the Dinky 16-G Express Passenger Set in dark blue with tan coaches. 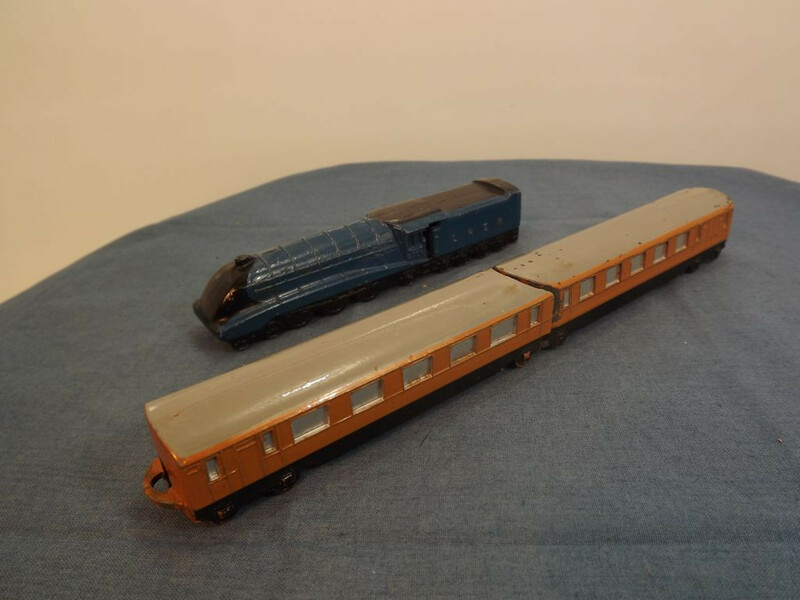 This item is described only as the "Streamlined Passenger Set" by Force in "Dinky Toys" [ISBN 978-0-7643-3319-4] but has two entries in The Richardson's "The Great Book of Dinky Toys" published in 2000 [ISBN1 872727 83 2] as both the "Streamlined Train Set" (1937-41) and as the "Express Passenger Train" (1947-59 - later renumbered to 798). 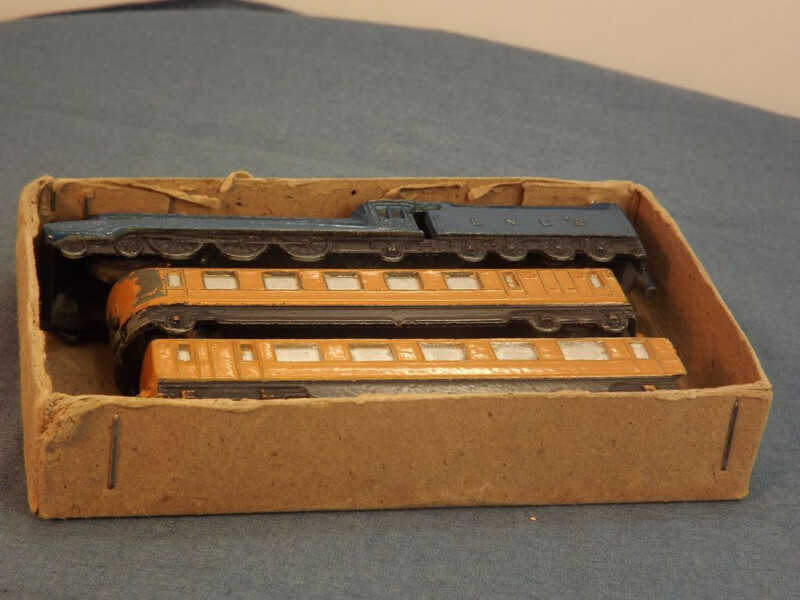 The Richardson's earlier volume ("Dinky Toys & Modelled Miniatures" from The Hornby Companion Series [ISBN 0 904568 33 4]) also refers to the set as the "Express Passenger Train" but the model I have was issued in plain brown card boxes with yellow labeling marked "Express Passenger Set". 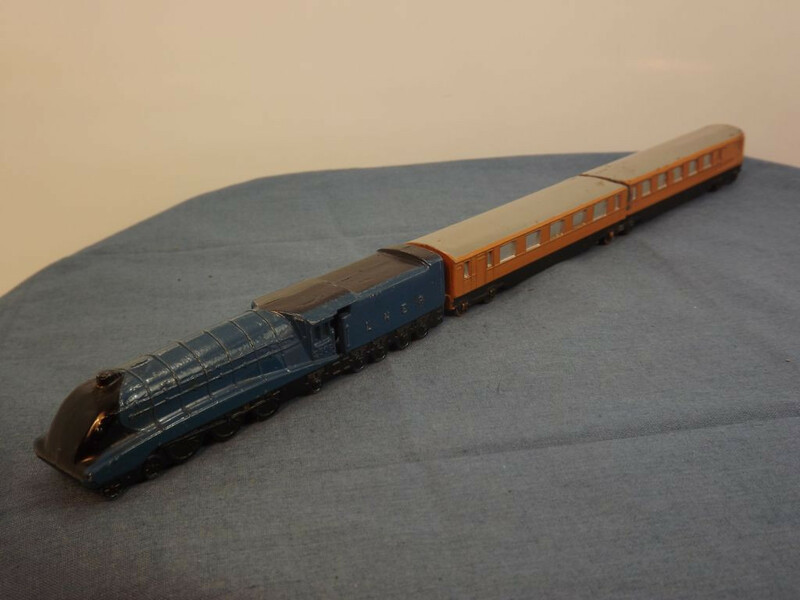 The model features a streamlined locomotive and two carriages. 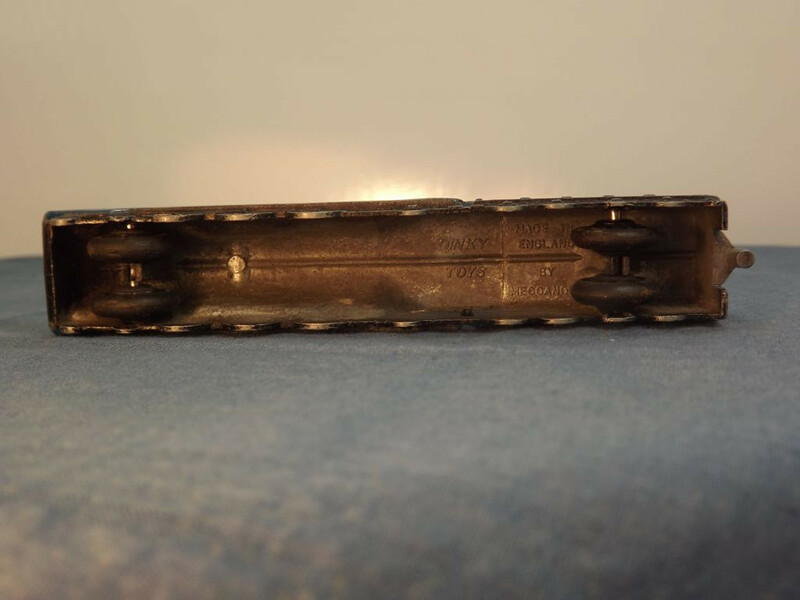 These are hollow castings without bases inside which is hidden the wheels. 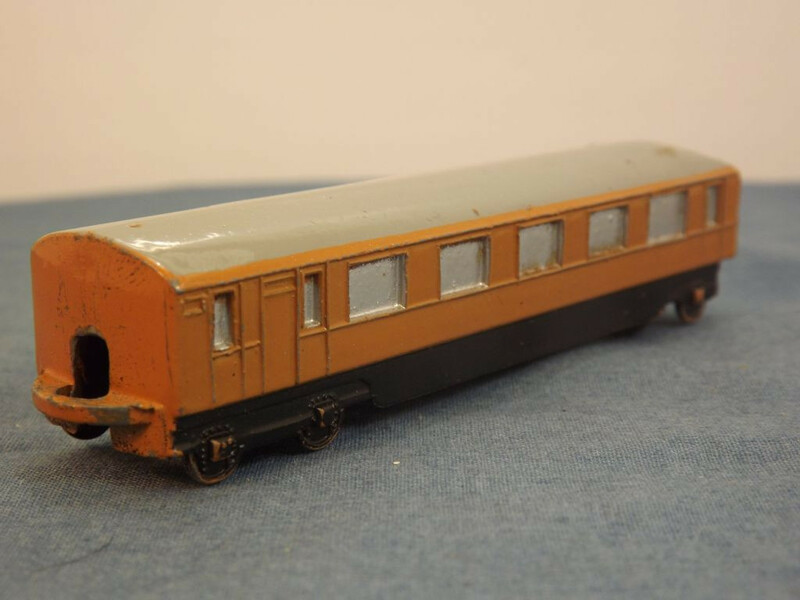 The pre-war versions had open windows but post-war versions had the windows filled in. 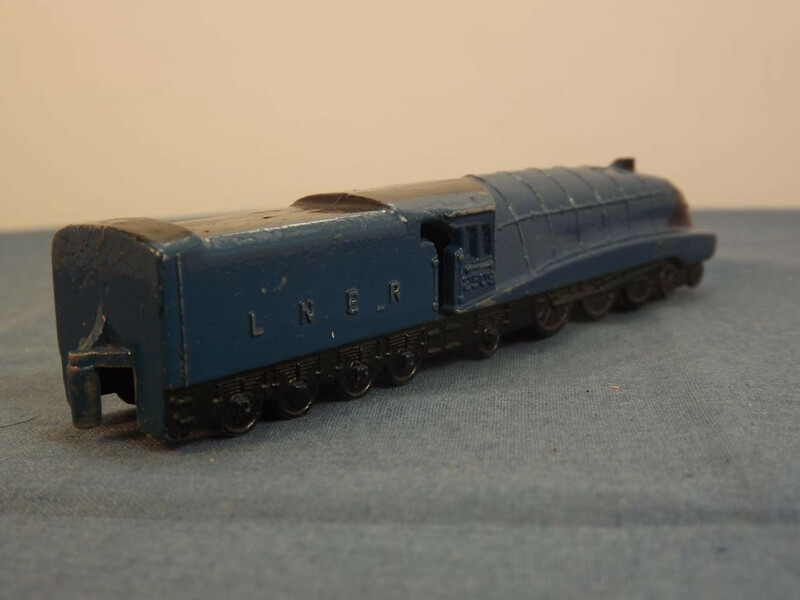 The locomotive is based on the streamlined LNER engine and was available only 7 months after the first real engine took to the tracks (1936). 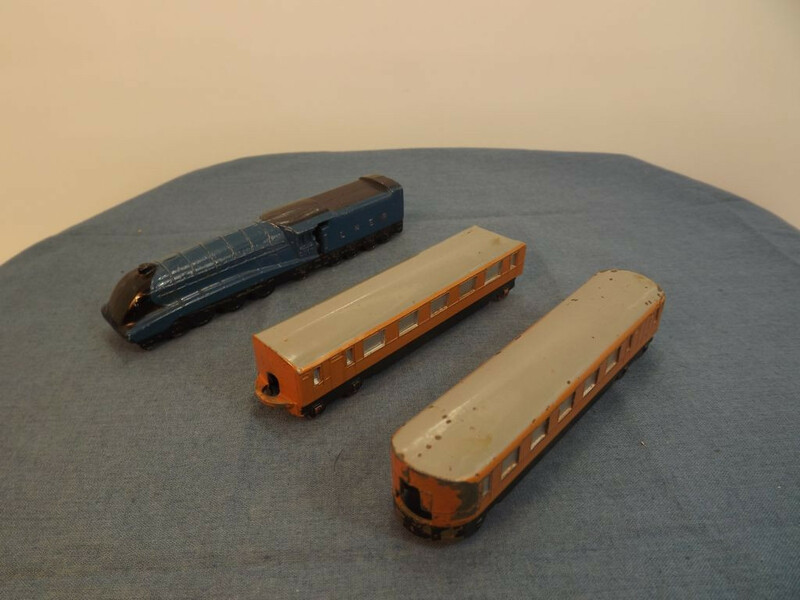 The streamlined engine from this set is done in the later colour scheme of dark blue and black and is accompanied by two teak/tan and grey coloured carriages which makes it an early release ofthe set, later carriages had cream rooves (roofs if you prefer the modern idiom). 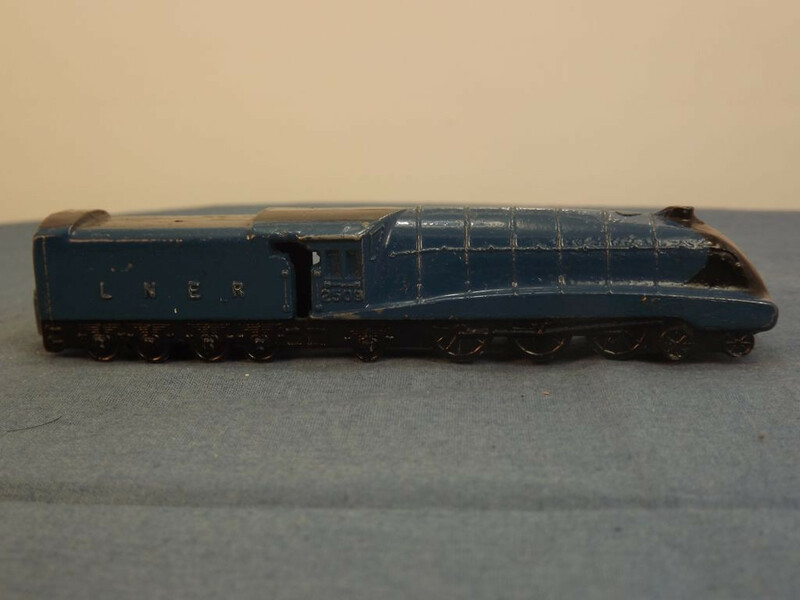 All detail is cast into the engine — wheels, body panels, funnel, cab, "LNER" on the tender and "2509" on the cab. Interestingly both Force and the earlier Richardson book both mistakenly state this number as "2590" while the later Richardson book corrects this. The centre (first) carriage is cast with a shallow convex (outward) curve on the leading edge with tow eye and opening in the front of the carriage into which slots the hook on the rear of the engine. 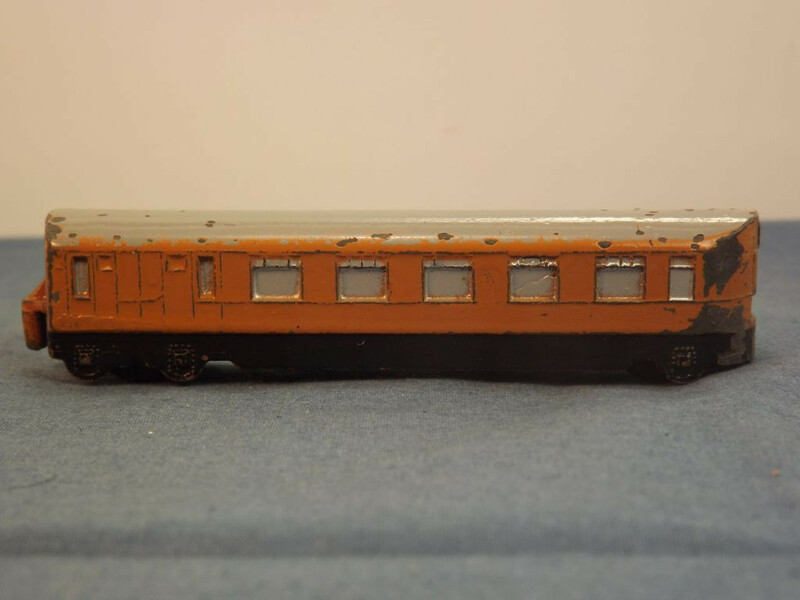 The rear of the carriage is shaped in a deep concave (inward) curve with hook that attaches to the second carriage. 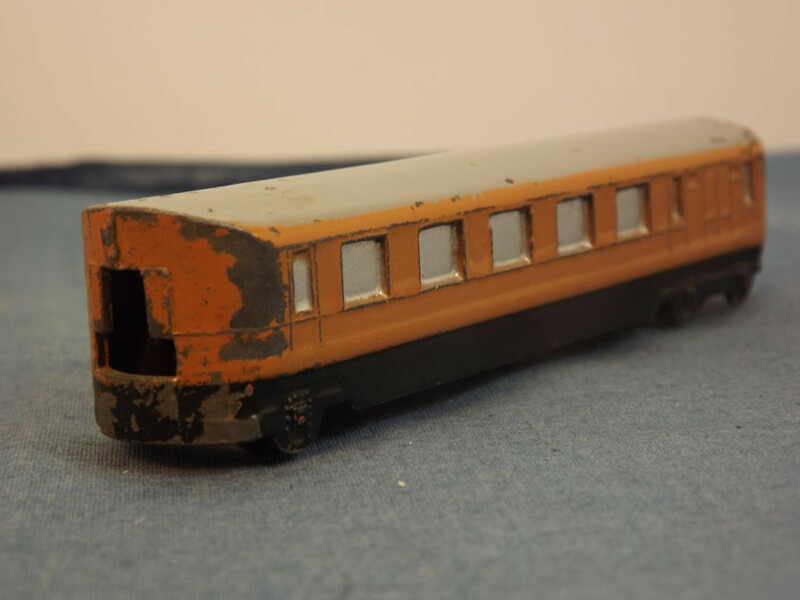 All detail is again cast into the body casting and the windows have been filled, identifying it as a post-war casting. 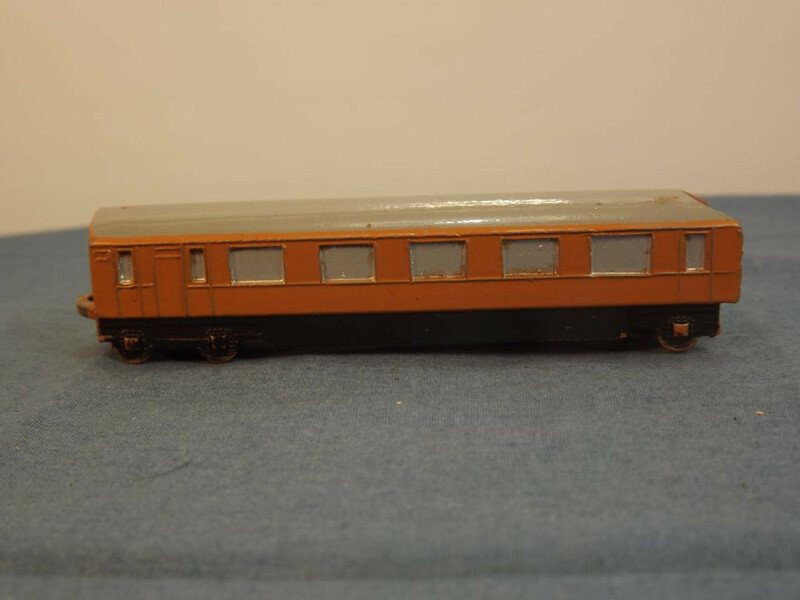 The carriage is in a brown, variously described as being "light", "teak", or "tan", has silver windows and a grey roof. 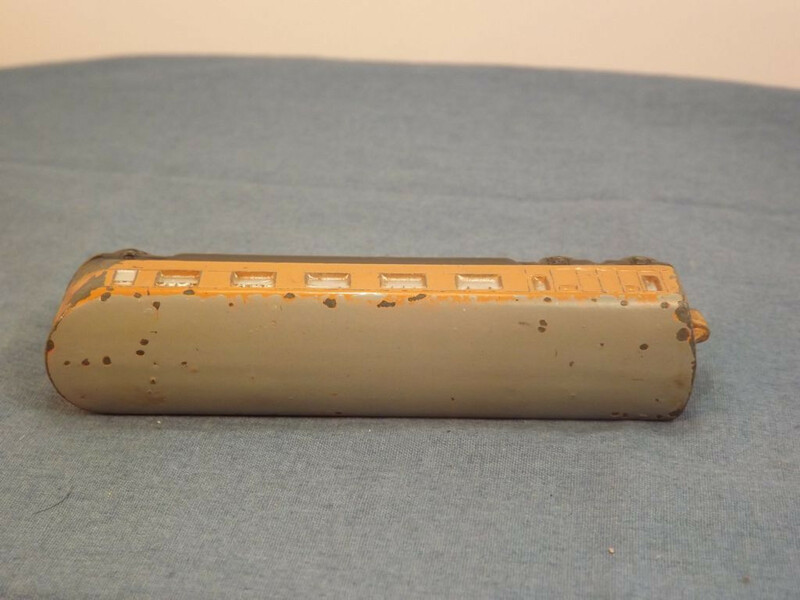 The lower portion of the casting depicting the carriage's wheels and chassis is painted black. 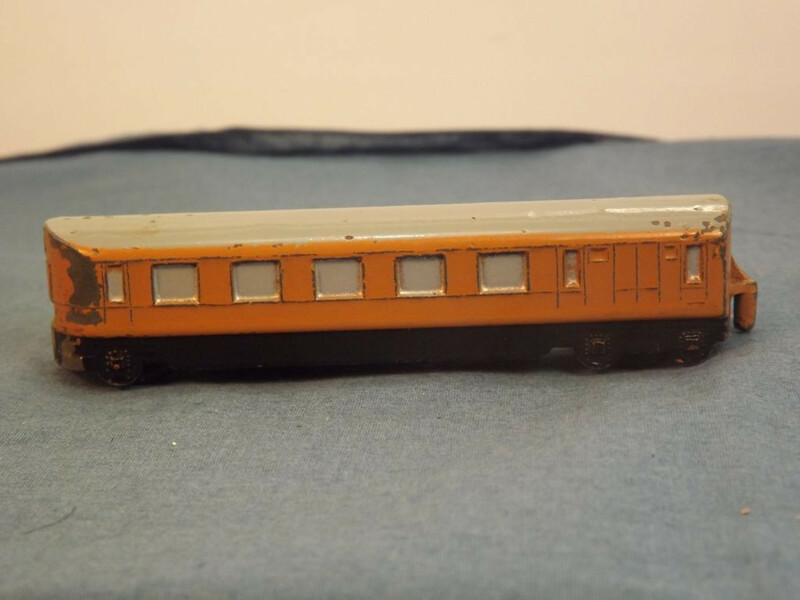 The second carriage is cast with a deep convex curved leading edge, allowing it to fit snugly into the rear of the first carriage, with an opening in the front of the carriage into which slots the hook on the rear of the first carriage. 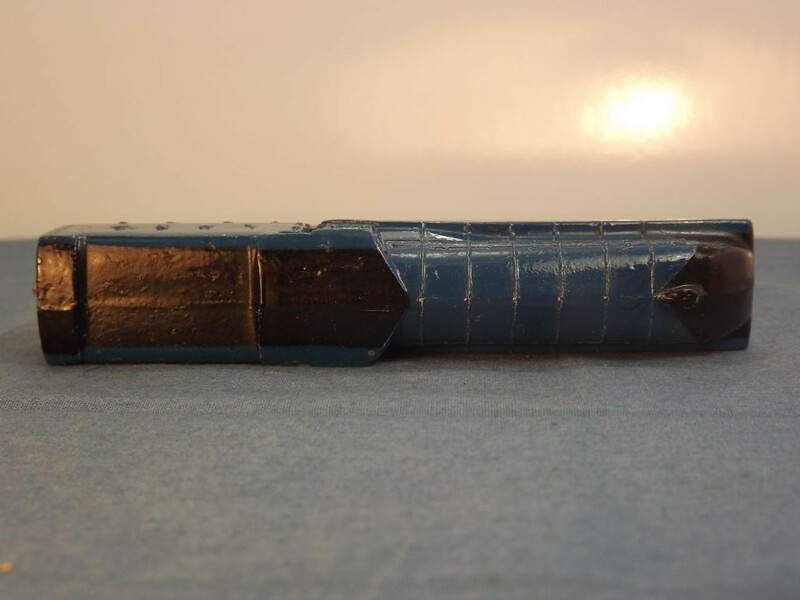 The rear of the carriage is shaped in a shallow convex curve with hook that could attach to a further carriage. 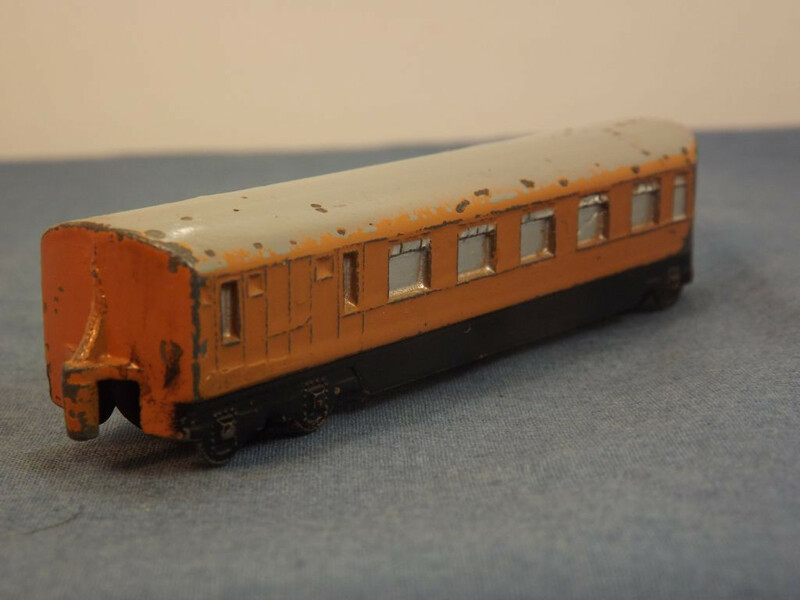 All detail is again cast into the body casting and the windows have been filled, identifying it as a post-war casting. 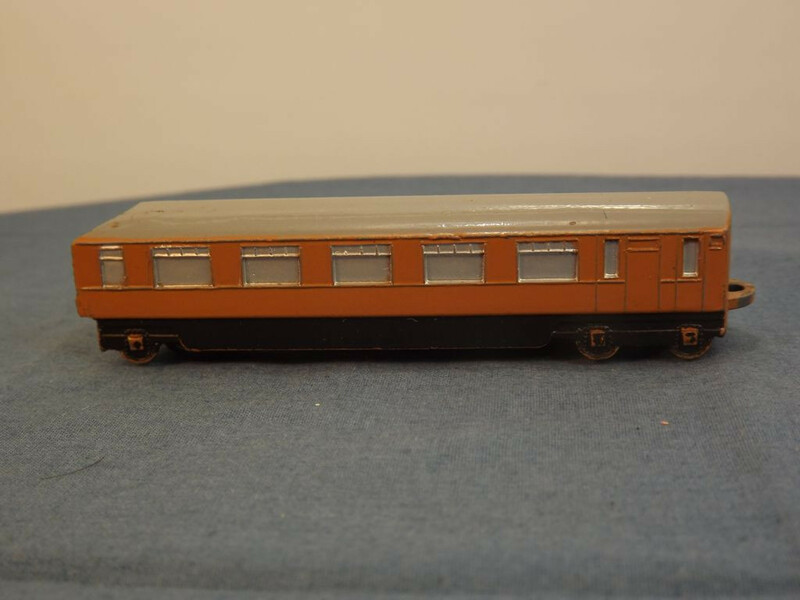 The carriage is again brown, has silver windows and a grey roof. 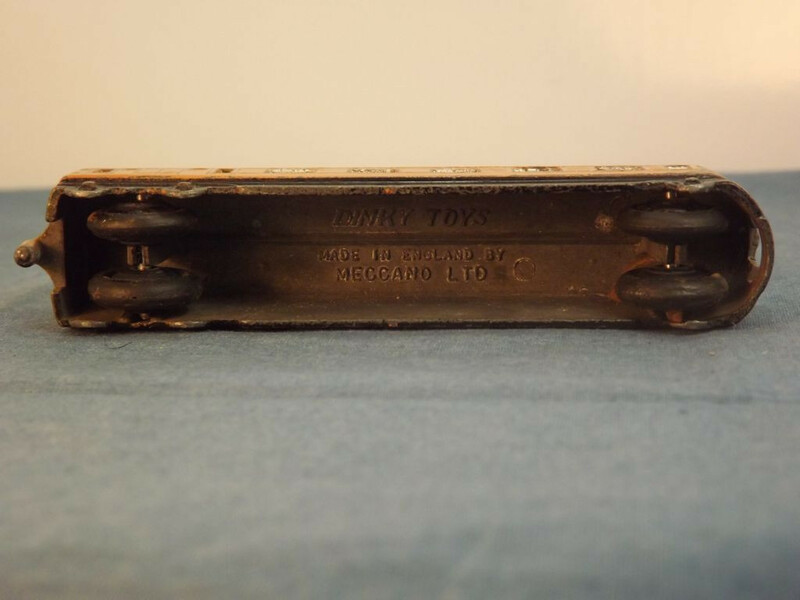 The lower portion of the casting depicting the carriage's wheels and chassis is painted black. 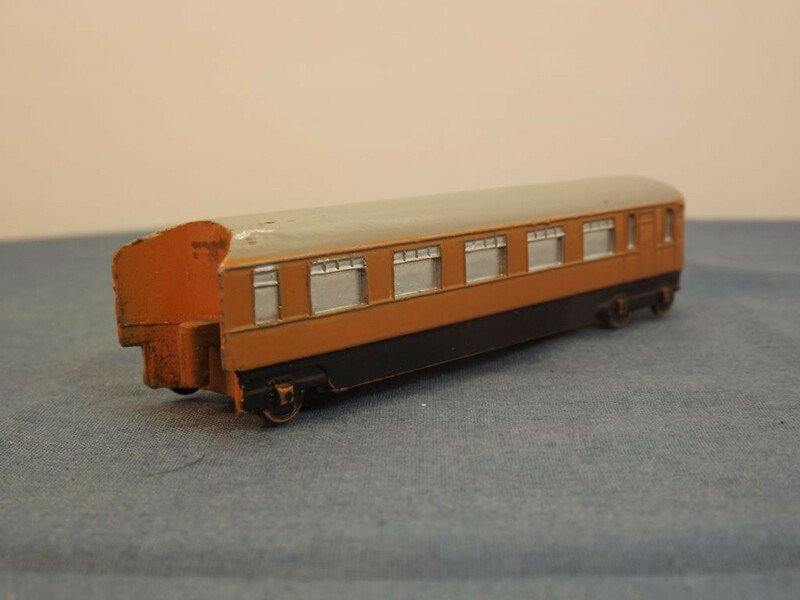 While the earlier Richardson book states "Thus it was not possible to incorporate additional coaches to produce a long train" I have found that by using sets of the pair of coaches it is possible to extend the length of the train as the first coach will fit onto the rear of the second coach quite adequately. 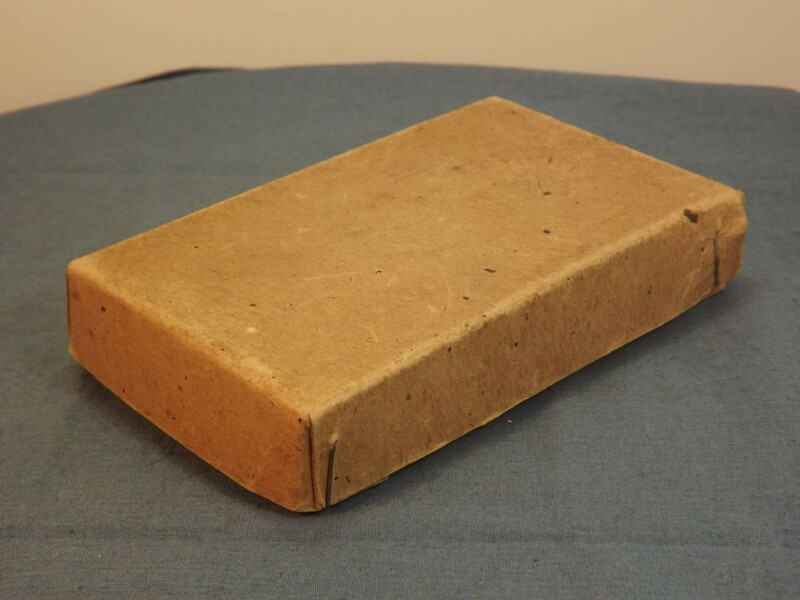 There is no base on the castings. 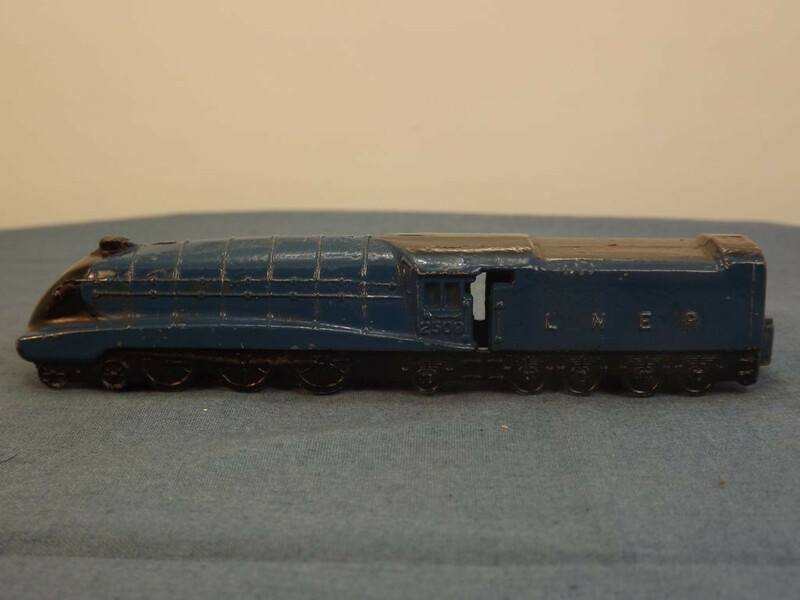 The underside of the engine is open and marked with "Dinky Toys" on two lines below the cab roof and "Made in, England, by, Meccano Ltd" on four lines on the underside of the tender roof, just forward of the rear axle column. 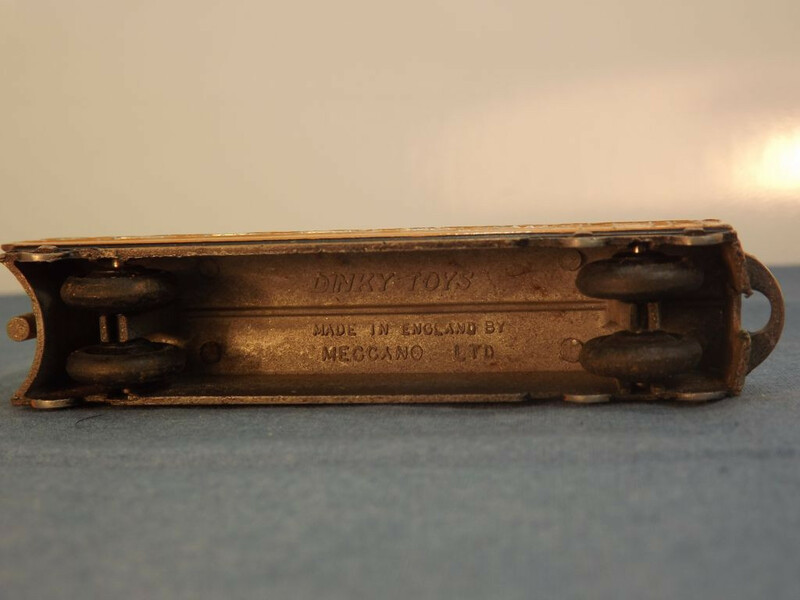 The underside of the first carriage is open and marked with "Dinky Toys, Made in England by, Meccano Ltd" on three lines on the underside of the carriage roof. 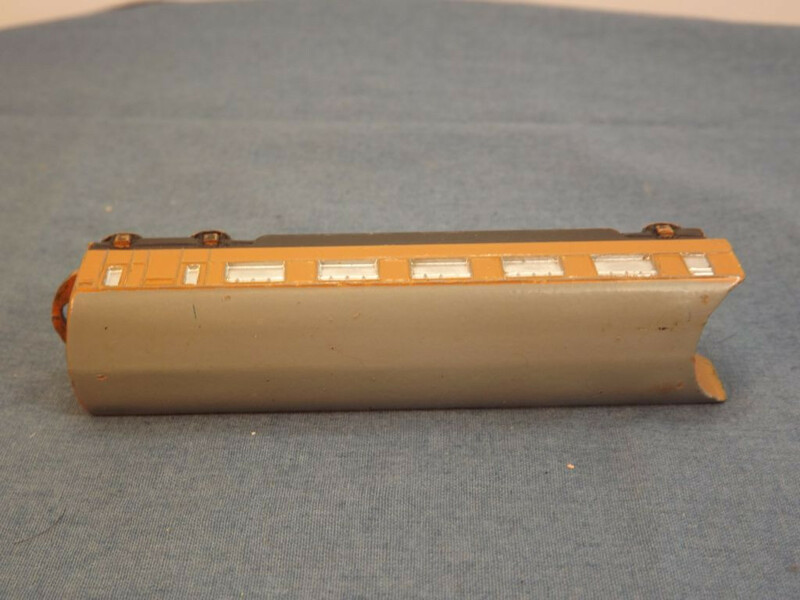 The underside of the second carriage is open and marked with "Dinky Toys, Made in England by, Meccano Ltd" on three lines on the underside of the carriage roof. All wheels consist of cast black hubs with black rubber tyres on steel axles. The axles are held in place by being pinch clamped to columns protruding from the underside of the casting. 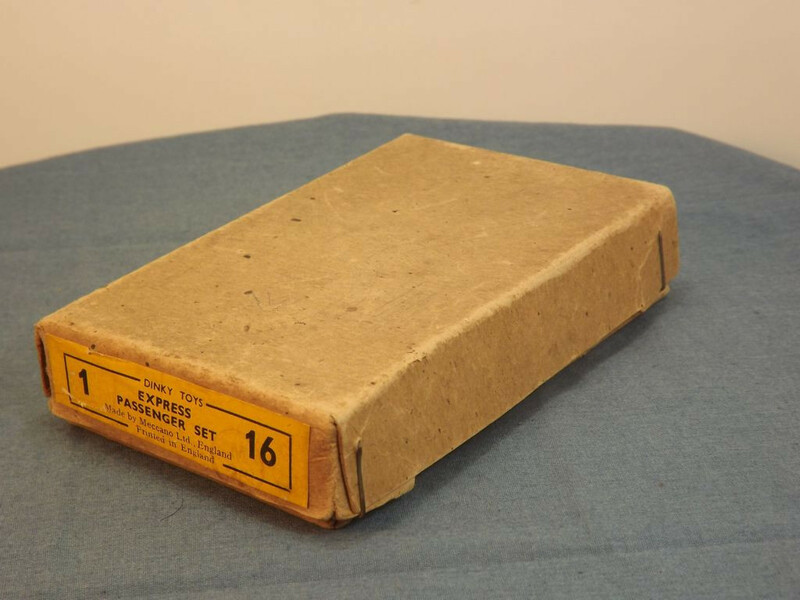 This model was issued between 1947 and 1959 and this set comes in a plain brown card box with a single, yellow, end label (see photo).